Hello and welcome to Newsletter #14! Belated Happy Holidays to you and your family! Again, this newsletter is late, late, late! Happily, we think the wait was worth it. In this issue, we have a ton of news, downloads, and an article on building monitoring applications using the IECS. We hope you enjoy the newsletter and find it useful. News: Inference Engine Component Suite (IECS) updated to v2.1! News: Object Inspector Component Suite (OICS) updated to v1.12! Note: You received this newsletter because you are an owner of a RiverSoftAVG product. If you received this newsletter by mistake or if for any reason you wish to not receive any future mailings from RiverSoftAVG, just reply to this message informing us so. We apologize for any intrusion. In this newsletter, we are going to build a common application (at least, that we've seen) of expert systems, a Health and Safety Monitoring system. The basic idea of a Health & Safety Monitoring application is to create a real-time or near real-time system to monitor incoming data to spot problems or potential problems. If the HSM application sees a problem, it then informs a user or other automated system about the problem so that corrective action can be made. HSM expert systems are a very common expert system. Fortunately, they are also very straightforward (usually) to make. The input data for an HSM application may be raw sensor values, derived (converted and computed) values, or even inferred values deduced by an expert system. The data could be coming in over a socket, from a database, from a simulator, or anywhere else. For the purposes of our HSM application, we are going to simulate sensor values directly within the application. The point is that we have data and that data may be "good" or "bad" or even somewhere in between. Note that this is in addition to the quality of the data. The quality of the data relates to how much you can believe the data is not junk or corrupt. An HSM application could be written to assess the quality of the data as well. But for this article, we are talking about what the data means. If SensorA is 100, what does this mean? If SensorA was a man's temperature, 100 degrees Fahrenheit means somewhat bad (not life-threatening but not good either). If SensorA was the temperature of water, it would mean the water is warm, which could be good or bad depending on the context of the system (if our system needed boiling water this would be bad as it is way too low. If our system needed bath water, this may be just right). When we talk about good or bad data, we usually get into the idea of limits. What are the maximum and minimum limits to the good data for a certain data value or sensor within our system? Many systems break the limits down into red and yellow limits. The yellow limits are the "somewhat bad" limits of the data, such as the man's temperature above. If his temperature was above 102, it becomes life-threatening and his temperature is "bad". This is a red limit. Note that for this article, we are going to write a "traditional" health and safety monitoring expert system that uses yellow and red limits. Because the IECS supports fuzzy logic, we can go beyond traditional expert systems and use fuzzy limits. However, we have enough on our plate this time so we will save the Fuzzy Health and Safety Monitoring expert system until part 2. The code and executable for our example HSM application are at www.RiverSoftAVG.com\Files\HealthAndSafetyMonitor.zip Before we build our HSM expert system, we need to build the infrastructure to simulate the values we are going to monitor. In the example application, we've defined a TCollection called TMnemonics, which will hold 0 or more TMnemonic items. (In the aerospace field, mnemonics are the short name label for the "real" name of ONE piece of data (one sensor)). Each TMnemonic class will represent one raw or derived sensor. It is the job of the TMnemonic classes to generate our test data. We are going to use the TMnemonic class to hold the raw and derived values, the formula we use to generate each time step, and the traditional low and high red and yellow limits. This is the data we get over our socket, or from our database, etc. 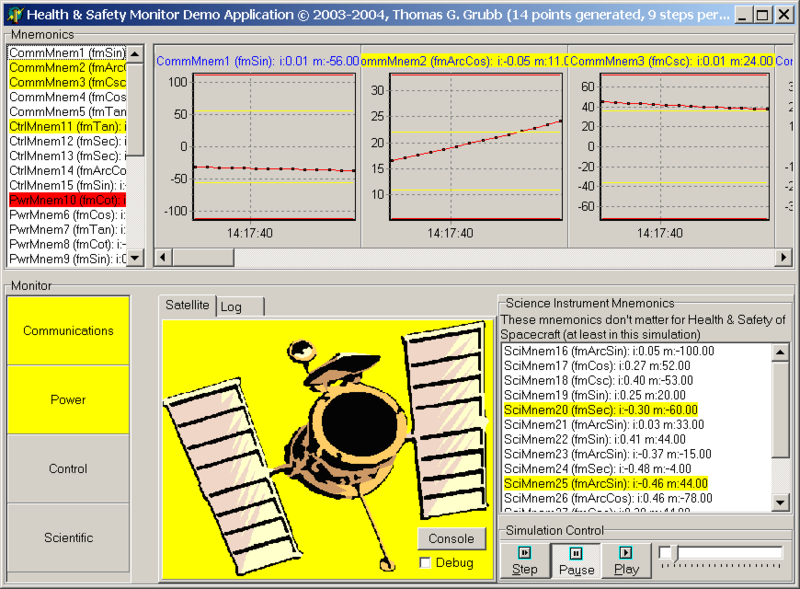 For this application, we are going to simulate monitoring a satellite. Our simulated satellite is made up of four different systems, each of which has a number of assigned mnemonics. The four systems are Communications, Control, Power, and Scientific (Payload). Using the MNEMONICS_PER_SYSTEM constant, we assign a number of mnemonics to each system. All extra mnemonics are assigned to the Scientific System. When the Health & Safety Monitor starts, we will create some number of mnemonics (defined by the NUM_MNEMONICS constant). Since this is a demo and we want to watch what is happening, we will also create a chart for each mnemonic to show the last 50 data points and the discrete red and yellow limits. Generating charts is controlled by the GENERATE_CHARTS constant. To simulate the data changing, we have also added a TTimer component to our application. Every time the timer fires (controlled with the SIM_SPEED constant), we will update our mnemonics using the specified formula. This will, in turn, update our charts and (eventually) our expert sytem. The HSM application has a number of constants and control variables defined at the beginning of the main unit. You are welcome to play with them. You can turn charts on or off, change the number of systems and mnemonics, and much more. Be aware that some options, such as generating charts with a LOT of mnemonics, can significantly impact the performance of the HSM. For this article, we are going to build four expert systems. To allow us to write one HSM application for all four expert systems, we have set up the HSM application to load its expert system from an external file. The file loaded is controlled by the EXPERT_SYSTEM constant. The four expert systems are in the same directory as the HSM application and all use the *.ie extension. As it is set up now, the HSM application will query the user on startup for the expert system file to use. The GUI for our HSM (see accompanying screenshot) will display the values and limits for our mnemonics on the top of the form. This will serve as a reality check for our expert system on the bottom. On the top left, we display all the mnemonics in a list box. All mnemonics exceeding red limits are in red, all mnemonics exceeding yellow limits are in yellow, and the rest are normal. The rest of the top of the form is taken up with a chart for each mnemonic showing its current value and some previous values. The bottom of the GUI is divided into 3 main areas. On the bottom left, we list the systems of the satellite. These also change color based on the status of the system: normal (clBtnFace), warning (clYellow), and alert (clRed). In the lower middle, we display the "satellite." This, too, will eventually display colors for the satellite's status. Finally, in the lower right, we display the science mnemonics and controls for the simulation. That's it for our structures. The HSM application will be responsible for fill the mnem-metadata structure on startup. It will do this once. Every time step, the HSM application will remove all mnemonic facts that currently exist and then assert new mnemonic facts. Note that this is inefficient if not all mnemonics change their value every time step. However, for simplicity's sake and because of how we defined the mnemonic's formula, we decided to just retract and assert every mnemonic every time step. At the end of every time step and after all mnemonics are asserted, the HSM application will then run the inference engine. We are going to make two assumptions about our expert systems for simplicity: 1.) the expert system will always finish, and 2) it shouldn't take long either. If the expert system did not finish, calling InferenceEngine1.Run would put the application into an infinite loop. If the expert system never finished or took a long time, we would have to run the expert system a few steps at a time and then return control back to the application. We will start with a very basic expert system, called "hsm - all systems.ie". The job of this expert system is just to detect if mnemonics are in-bounds, exceed yellow limits, or exceed red limits. When a mnemonic is found that exceeds yellow limits, we are going to issue a warning for the system it belongs to. When a mnemonic is found that exceeds red limits, we are going to issue an alert for the system it belongs to. We wish to receive only one alert or warning per system no matter how many mnemonics are out of bounds. Note that we are setting set-fact-duplication to TRUE for the expert system. This means that the inference engine will throw away duplicate facts when they are asserted. So even if more than one mnemonic exceeds its limits, we can only receive one alert and one warning (though we can receive both). That's it. Now run the HSM application using the expert system. Press the Play button and watch it go! Because this is a basic expert system and our simulator is very basic, you will be able to see the expert system flag LOTS of limit violations. But everything looks correct so we are happy with our first attempt. Well, our Health and Safety Monitoring expert system worked but it flagged way too many violations. If we think a moment, we realize that the scientific system really has nothing to do with the health and safety of the satellite (or at least, we assume so for our example). Ideally, we could just never assert mnemonic facts for the science system. However, we may need those facts for something else, so let's just modify the expert system rules. The file, "hsm - system basic, no science.ie," contains our new expert system. Run the HSM application again, select this file, and press Play... MUCH Better. We have reduced a lot of spurious warnings and alerts that really didn't contribute to our monitoring of the satellite. If ANY besides scientific system is red (alert), the satellite's health is critical. If more than 50% of the non-scientific systems are yellow (warning), the satellite's health is failing. Otherwise, the satellite's health is good. "if any system alerts, satellite is critical"
"count the number of systems that have warnings"
"if no system alerts but more than 50% systems are yellow, satellite is failing"
You can load this expert system from the file, "hsm - satellite basic, no science.ie"
For our last expert system, we wanted to fine-tune our warnings and alerts for each system. The first three expert systems are very simplisitic in that just signal a warning or alert if a violation is found for any mnemonic of a system. This time, we are going to assume that there is some redundancy in our satellite or wiggle room for displaying warnings and alerts. To make it interesting, we will treat each system differently. An alert will be given when there is not enough bandwidth for everything. A warning will occur when load exceeds 80% of capacity. "count red-limit violations for each system"
"Comm gives alert when can no longer provide bandwidth for all science instruments"
"Control needs at least 2 good gyros or combo of 3 good/yellow"
These are simple rules, and this has been a *long* article, so we will refer curious readers to the expert system file, "hsm - satellite, no science.ie." You can now load and run this expert system in the HSM application. That's it. For this article, we are done. There is obviously a lot of extra work that could be done on this application. Adding more inferred facts and inferring facts from those inferred facts (mnemonics cause subsystem alerts which cause system alerts which cause satellite alerts) ad nauseum would increase the complexity and hopefully the intelligence of our expert system. More significant rules would also be nice. But this was a lot for one small tutorial and it is enough to get you started. The rest is left up to the reader :-) Next time, we are going to extend the HSM expert system and create a fuzzy HSM. See you then! The Inference Engine Component Suite has been updated to v2.1. Owners of the IECS v2.0 can go to the web site and download their new update from the http://www.riversoftavg.com/support.htm page (you will need the user name and password). The IECS v2.1 is in many ways an important update because it includes one seemingly minor feature and one major feature. The minor feature is that we have changed our installation procedures to use InnoSetup. InnoSetup is by Jordan Russell and is a free installer for Windows programs. By replacing InstallShield with InnoSetup, all of our installations will now automatically install the components into Delphi and install the Help. No longer will you have to add components or help manually! Also, InnoSetup allows us to automate creating new releases. This will reduce the number of errors (once we shake out the bugs) and hopefully allow us to create smaller point releases more often. The major feature is it includes a large update to our fuzzy logic library. We have added new components and features to the fuzzy logic library. Soon, we are going to offer it as a stand-alone component product. Don't worry, the Fuzzy Logic Component Library will always come bundled with the IECS as it is a vital part of the fuzzy logic support in the IECS. However, now you will have access to the standalone product as well so you can use fuzzy logic in situations you don't need to full IECS. Please read more about the fuzzy logic library in the following news item. News: Upcoming Fuzzy Logic Component Library! RiverSoftAVG is proud to announce the beta version of a new product: the Fuzzy Logic Component Library. We've enhanced the great and tried-and-tested fuzzy logic features of the Inference Engine Component Suite and are creating a standalone product. The FLCL will always come bundled with the IECS (so IECS users, you will never need to buy this product). However, for users who don't need the complexity (and price) of the IECS but who need some fuzzy logic, this product is for you. The project is currently is beta. As promised last time (see "Tip: Using the IECS with the OICS" in newsletter 13), we have a free download available for registered users of both the IECS and OICS. We've created some Object Inspector Property Presets for editing special properties of the inference engine. In all, there are 8 presets for defining property editors using the IECS with the OICS. This is a free download, with source, available from the http://www.riversoftavg.com/downloads.htm page. One tip: with these presets installed, every time you drop an object inspector on the form, the object inspector automatically adds these presets. If you do NOT use a IECS component in your project, when you run your project you will receive an "Error reading RSObjectInspector1.HPresets: Class TRSTIExxxPropertyPreset not found" exception. The solution is easy, just delete the IECS presets from the Presets property of the Object Inspector. Well, that's it for this time. Happy Holidays and see you in the New Year!